An unplanned spacewalk has been completed on the ISS, successfully fixing a stuck transportation cart outside the station. The hardware was preventing the movement of a robotic transporter along the station’s Truss. While not a critical safety issue, the situation was highly undesirable, hence a quick resolution was required. The EVA lasted three hours and 16 minutes. 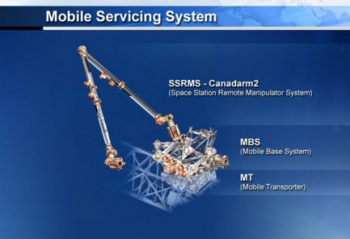 The issue in question concerned a piece of hardware known as the Mobile Transporter (MT), which serves to transport components of the station’s robotic Mobile Servicing System (MSS) along the station’s Truss structure. Along the front side of the station’s Truss structure – specifically the S0, S1, S3, P1, and P3 Truss segments – exists a rail structure, which the MT is able to move along, in order to provide transportation to the station’s robotic arm. This enables the arm to move from one end of the Truss structure to the other, thus greatly extending its reach. 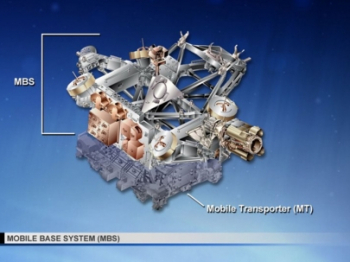 Attached to the MT is another piece of hardware called the Mobile Base System (MBS), which serves as a supporting structure and interface between robotic hardware such as the Space Station Remote Manipulator System (SSRMS), the Special Purpose Dextrous Manipulator (SPDM), and the MT. The MBS features four Power & Data Grapple Fixtures (PDGFs) that can each serve as a base point from which the SSRMS can be controlled. The MBS also features the Payload ORU Accommodation (POA), which is essentially a Latching End Effector (LEE) like that found on the SSRMS, which can hold onto payloads while the MT transports them. The SSRMS is normally based on either Node 2 or the US Lab, which are both located in the center of the station’s Truss structure. However, if the SSRMS needs to reach either end of the Truss structure, it can move, or “change its base”, to the MBS, which will then, along with the MT to which the MBS is attached, move along the rails located on the Truss, thus allowing the SSRMS to reach the outer edges of the Truss structure. The MT can only move at a maximum rate of one inch per second, and is propelled by a piece of hardware called the Linear Drive Unit (LDU). However, the MT cannot stop at any given location along the Truss rails. Instead, it must stop at any of the ten designated “worksites” located along the Truss rails. These worksites feature mechanical and electrical connections to allow the MT to secure itself to the Truss, and to provide power to the MBS and its attached robotic hardware. When the MT moves along the Truss, or is stationary in between any of the worksites, it is only lightly attached to the Truss rail structure via wheels known as Roller Suspension Units (RSUs). Electrical power for MT translation via the LDU is available through the Trailing Umbilical System (TUS), which is a cable reel that extends and retracts as the MT moves. The MBS and attached hardware are unpowered during MT motion or when the MT is not located at a worksite. However, when located at any one of the ten worksites, the MT securely clamps itself to thicker portions of the Truss rails via Load Transfer Units (LTUs), which take over from the RSUs. Electrical power is available via the Umbilical Mechanism Assembly (UMA), which provides power to the MBS and attached hardware. Two Crew & Equipment Translation Aid (CETA) carts are also attached to either side of the MT. The CETA carts are transportation aids for spacewalkers, to which EVA hardware can be attached, with the CETA carts then being manually moved along the Truss rails by spacewalkers. The CETA carts feature two Dynamic Brake handles, two Parking Brake handles, and two Parking Brake Release handles, all of which can be manually operated by spacewalkers in order to arrest the CETA cart’s motion and secure it to a desired location along the rails. The CETA carts are attached to the Truss rails via four Wheel/Brake Assemblies, with one being located in each of the four corners of their respective CETA cart. 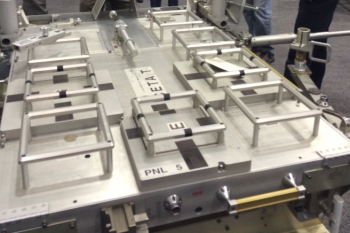 The two CETA carts are attached to the MT when not in use, which allows them to translate along the rails along with the MT whenever it moves. On December 17, while the MT was in the ground-controlled process of translating from Worksite-4 (WS-4) to WS-2, the Translation Drive (TD) Integrated Motor Controller Assembly-A (IMCA-A) experienced an error, resulting in MT motion being stopped shortly after the MT had left WS-4. Another error was then experienced when the MT attempted to translate back to WS-4. 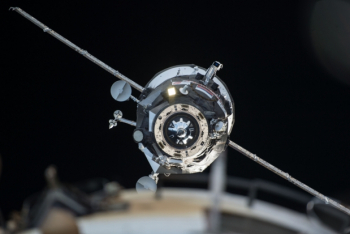 The MT was effectively “stuck” in this position just short of WS-4, which is located just to the Starboard side of the S0 Truss, very close to the center of the Truss. As such, the MT was unable to engage the LTUs or the UMA, and as such was only lightly attached to the Truss rail via its RSUs (which are braked). Electrical power to the MBS is being provided via the Mobile Transporter Relay Assembly (MTRA), which was only recently installed on the ISS in October 2014, with the purpose of providing power to the MSS when the MT has stopped motion between worksites, in order to provide “keep alive” power to the MSS in the event that the MT gets stuck. After analysis, ground teams believed that the stuck MT was likely caused by a brake being engaged on the Starboard CETA cart, which was preventing the MT from moving as the CETA cart is attached to the MT. Ahead of the EVA it wasn’t fully known whether the brake handles were responsible for the engaged brake, or whether one of the Wheel/Brake Assemblies had somehow failed. 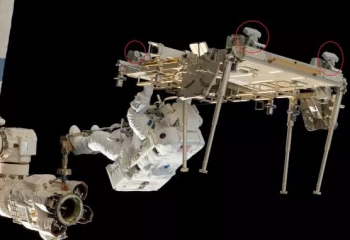 The Starboard CETA cart brake handles were only recently tied-down by astronaut Scott Kelly during US EVA-33 back in early November, leading to the possibility that they could have somehow inadvertently been engaged at that time. The concerns with having the MT remain unsecured to a worksite, aside from the fact that robotic operations are greatly impacted as only keep-alive power is available to the MBS and attached hardware, are that the ISS cannot conduct “dynamic” operations, such as attitude changes, as the potential exists for the MT to move around and become damaged as it is not securely latched to the ISS. This in turn affects dockings of Soyuz and Progress vehicles, which require ISS attitude changes. Following the successful departure of Progress M-28M (19 December), Progress MS-1 launched (21 December), for a docking two days later. Hence, there was a desire to resolve the stuck CETA cart/MT issue before then. Following a meeting (20 December), the ISS Mission Management Team (IMMT) gave a GO for an EVA to attempt to free the stuck CETA cart, to occur Monday (21 December). 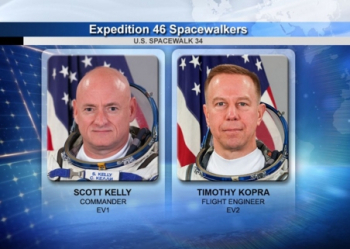 This EVA was planned to last around 3.5 hours, conducted by NASA astronauts Scott Kelly and Tim Kopra. The plan was to have the spacewalkers check that all the brake handles on the starboard CETA cart are not engaged, and if they are engaged, to release them. That proved to be the case, as Kelly worked to put one of the brake handles back into a nominal configuration – allowing the MT to return to action. The spacewalkers had to go about their work carefully, ensuring the CETA cart did not suddenly “jolt” when the brakes were disengaged, due to stored mechanical energy. 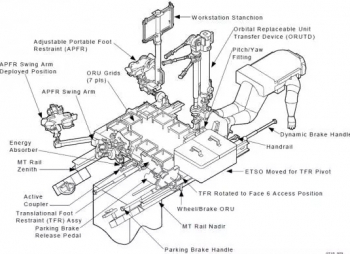 Once the spacewalkers verified that none of the brake handles were no longer engaged, ground controllers moved the MT back to WS-4, which indicated that the problem has been resolved. The MT is now back in a nominal configuration, with electrical power confirmed by the ground controllers. Alternative options – no longer required – would have included the removal of the CETA cart from the Truss rails completely. It was also possible to remove and replace each of the four Wheel/Brake Assemblies on the CETA cart. It wasn’t known whether any of these methods would be attempted as a next step, had they been necessary. With the stuck CETA cart resolved quickly, get-ahead tasks were available to the spacewalkers. These included routing some International Docking Adapter (IDA) cables, and opening the Starboard Station Power Distribution Assembly (SPDA) doors to allow future robotic replacement of Remote Power Control Modules (RPCMs). 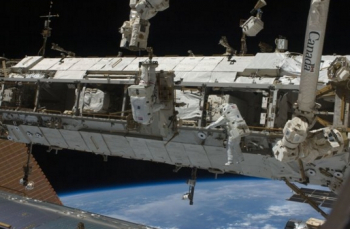 The shorter-than-usual spacewalk was completed with a Phase Elapsed Time (PET) of three hours and 16 minutes.